Time for ourselves is something we all need now and then. That’s why we make bathroom furniture that gives you space for everything you need – and smart ways to organize it all. That way, you can spend less time looking for the toothpaste and more time doing what’s really important: taking care of yourself. If you have an organized bathroom store space then you can calmly find your hairbrush, even during the hectic morning rush hour. Though bathroom is a tough place for furniture, so make sure you choose a quality product that can last long. Organized bathroom- The secret is in the storage. 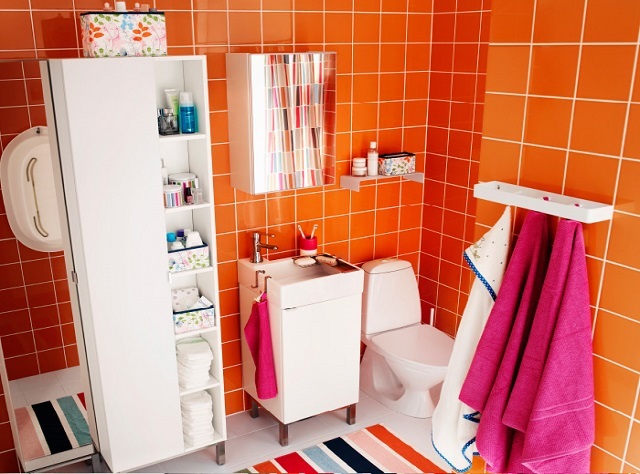 Easy access to what everyone need and a calm, organized space, make a happy bathroom. A great tip is go for open storage for things that you want quickly, then hide the rest in well-organized drawers and cabinets to keep away clutter. Make space with boxes and baskets, organize your shelf, drawers and even walls, so everything is easy to find. You get the best out of space and a most relaxing bathroom for the whole family. Get transparent organized inside, with transparent boxes inside your drawers and cabinets, you will never lose and eyebrow pencil or earring again. Laundry Cabinet– To make your laundry routine relaxed and caring for clothes easier, have a laundry cabinet that has partition for coloured clothes and white clothes. This will help in instant sorting and makes laundry cleaning as smooth as newly ironed pants. Go for vertical and corner storage – Use your bathroom walls offers by going for vertical storage and display as bathroom walls above 7 feet are usually wasted with empty area. This space can be used for storage of toiletries, bathroom cleaners and sprays. Corners are often dead space in a room but with corner shelf units they can free up valuable space in your bathroom for storage and shelving. Mirror full of surprises– A full-length mirror is meant for much more than an outfit check. It also hides a wall full of bath supplies. Mirror cabinets double as storage and larger mirrors will make your bathroom look brighter and bigger. Add a vanity mirror for close-ups and to make sure your hair is doing what you want at the back, too.